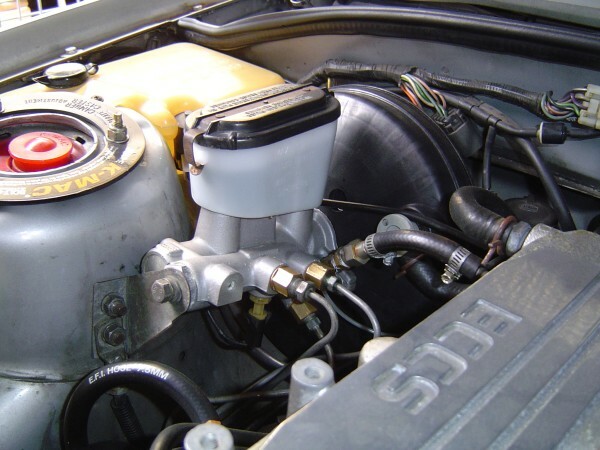 How to adapt the VT Master Cylinder to early model Commodores. The principle behind this is that the standard 1" master and booster from the early V8 and turbo models give a less then satisfactory pedal feel and stopping power. Using the below parts, you can achieve a massive improvement in braking power with less pedal effort required. It is highly recommended on the VT Twin Spot Caliper Upgrade and also the Nissan 4 Spot Caliper Upgrades. It is more or less a straight forward bolt up proposition, with just a few small, but important modifications. To do the following upgrade you will need the following. 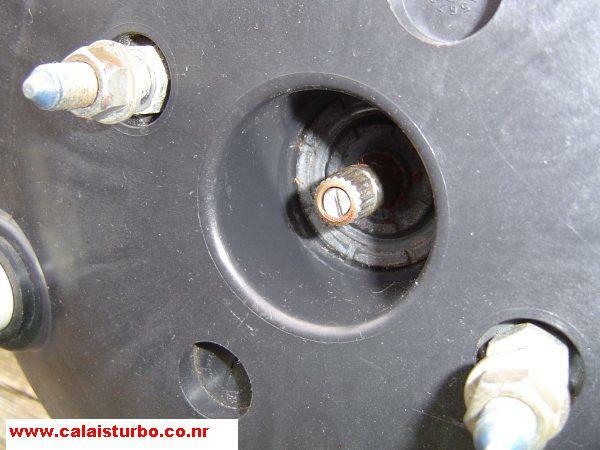 On the V6 VS plastic booster, unscrew the adjustable bolt in the end of the pushrod. 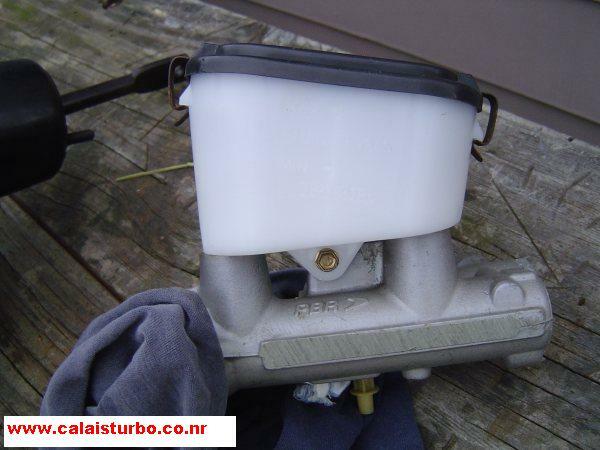 Remove the VT Master Cylinder Reservoir with the small bolt on the side and fit the brand new VS Reservoir. Note: If your careful the seals in the bottom of the master cylinder will be fine and you can just push the VS reservoir into place without replacing the seals. 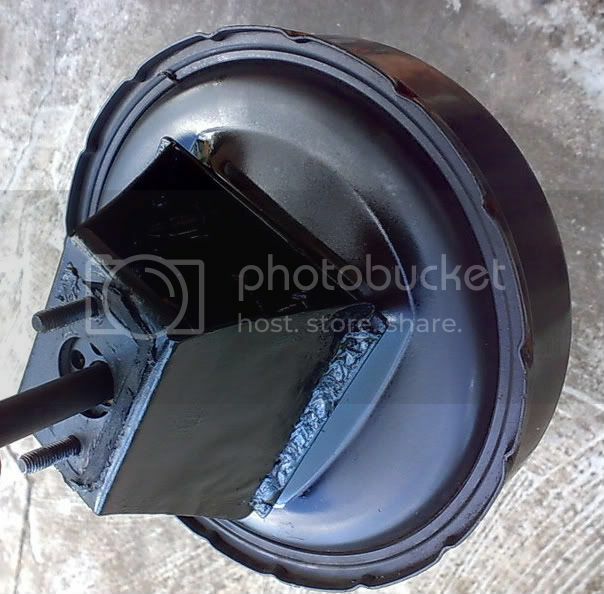 We fit the VS reservoir so it sits level and can be filled properly, the VT item sits on an angle and prevents the master from holding the proper volume of fluid when used on early model commodores. Screw in the line adapters with the copper washers supplied and torque up firmly. 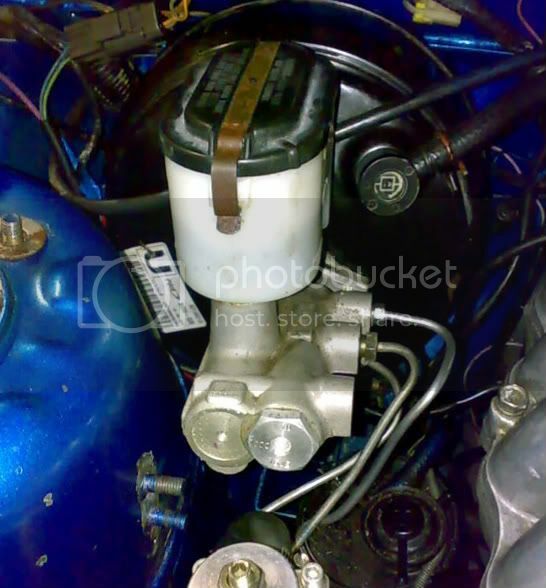 Bolt the VT master cylinder to the VS booster. Now you can bolt it into the car the same way as your removed your old setup and bleed the brakes, starting from the Rear Left, Rear Right, Front Left and finally Front Right. Note: The emergency brake light connector will plug straight on to the VT master cylinder. If you followed the above you should have achieved a greatly improved pedal feel and improved braking power. It is amazing how even the single diaphragm V6 VS unit give more power and assistance then the highly overrated double diaphragm steel unit from the early model V8 and Turbo vehicles. Last edited by RB30-POWER; 11-04-09 at 11:50. Can you adapt the VT booster? VT Booster has been done, but it requires custom fab work and welding, webpage somewhere on the net that shows whats involved. It requires a bracket to made to mount the booster correctly. Its quite an involved and lengthy process, probably not really owrth the effort. Great work again, RB30-POWER; I'm glad to see you've made it into a well presented technical article. Great article, why is there always something eles I have to do. I guess this would be on the list of must do now Ive ordered my new 6 pot ap racing calipers? Is there much difference in boost (VT vs. VS) ? From looking at the pics there - it seems the Bracket holding the Master Cylinder onto the Strut tower is the NA 15/16 MC version. The bracket from the 1" MC version is different - a 'mirror image' of the NA bracket, due to the fact that the VLT/V8 booster is longer. 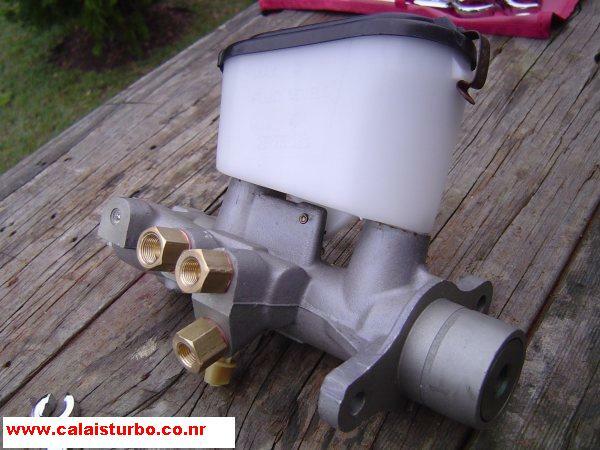 Might be something to add to the Needed list for people that are upgrading from VLT/V8 1" Master cylinder setup. hey all, my old NA brake booster died so i just finished putting in a complete vt-vx booster & master. It fits with only a coupla mods, I had to mod the bracket, drill a hole in the rod for the pedal, and slightly panel beat under the booster. I might put some pics up later if anyone is interested. all up cost - $100 including fluid,master cyl & booster. Breakin traction... or breakin down..
Cant you get spacer aswell to suit the VS brake booster to the VT master cylinder. I think they are like $50? Oh by the way, the VS booster is only single diafram isnt it as opposed to the VT being twin diafram? Do you think this would cause any issues? the vt double diphragm unit will offer more assistance compared to the vs unit, yes, but it's not really going to cause an issue. yes, you can get a spacer if you want to spend extra and not mod the pushrod, but modifying it is hardly a chore if you have some basic tools available. So basically with the VS booster you will just have to press the pedal a bit harder compared to the VT? I'll eventually be running the nissan 4 pot calipers and 2 pot rears. Not really a fan of the VT sliding calipers. Wouldn't trust it, but keep an eye on it mate just to be safe. 10mm sounds way too thick for the spacer. Its been a couple of years since i did this conversion but i would guess that it would be around 3-4mm thick. Why would you go to the trouble of making one when you can make such a simple mod to the pushrod and the whole setup bolts up? No one else makes the line adapters, i tried Pirtek, Enzed, several other hydraulic companys we use through work, no one could supply them. Thats crazy mate, flared tube fittings are designed to seal on the taper, you are relying on the end of the tube to seal. there is nowhere near enough surface area on the end of the tube to trust to seal. These are your brakes - the things that may mean the difference between life and death one day. Please use the correct fittings, for your own good and the good of other road users! I measured it up and it came to 10mm. Anyways i've decided to do the mod as it is described here as it looks more factory looking that way. Is there a tool available to reflare the lines to suit the VS/VT setup? no leaks after 6 months, ill keep an eye on it, but its screwed up tight. I had to panel beat the section directly under the booster as its a slightly larger diameter, If you do it properly and give it a quick respray in that area, you shouldn't even notice it. Last edited by Hardcorz; 20-05-08 at 21:26.
dont forget to drill a hole in the rod that connects to the pedal as ppl have mentioned before, otherwise the brake pedal sits about 2 inches higher than the accelerator pedal. haha true how far back from the excisting hole do you drill the new one? only need a mill back behind the existing hole, there is no pressure on that side of the hole as it only pushes the rod in, doesn't get pulled out. IT will sit about level with the accell pedal when its done, I wouldn't drive it without it done, too awkward. (_OO________ <- as in my crappy drawing here..
You will also need to cut off the overhang through the middle of the first hole, otherwise it will interfere with the bracket under the dash. BTW: The stopping power is awesome, I can stop soooo much better without locking up. one of the best things i ever done to my car. Last edited by Hardcorz; 22-05-08 at 23:32.